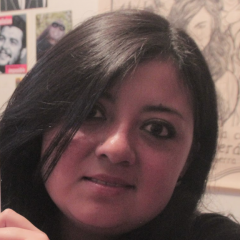 Johanna Lombeida is a member of the broadcast team of the weekly radio magazine program “La Movida Independiente” on Wambra Radio in Quito, Ecuador. She also writes for Transistor Extremo. The following is a transcript of the video about Johanna's analysis of the word cloud for the term, “género” (gender) within the Ecuadorian context. Yo escogí la nube de “género”. Me sorprendió bastante el hecho de que partamos de género desde el punto de un discurso solo de mujer. Otras cosas que me impactaron también fueron que salió (la palabra) comunicación. Tuve la oportunidad de verificar entre (las palabras) “género” e “ideología”. No mencionamos a actores políticos. Algo que también me llamó mucho la atención fue que como en cuatro o cinco veces se toma el término de “erradicación”. (Me sorprendió) que todo va dirigido sólo a la mujer, como que si el tema de género sólo fuese destinado para la mujer. También hay algo importante que es que casi en la última línea encontramos (la palabra) “unidas”, también solo dirigido a la mujer. Creo que el tema de género nos compromete a todos, entonces eso me llamó bastante la atención. I chose the word cloud of the word “gender”. I was surprised to see that we are understanding gender from a discourse that is exclusively based on women. Other things that caught my attention were that the word “communication” was present. I had the opportunity to contrast the words “gender” and “ideology”, and there is no mention to political actors. I was also impressed to see that the word “eradication” was mentioned four or five times. I was surprised to see that everything is directed only to women, as if the topic of gender would only interest women. Another important thing is that closer to the end (of the word cloud) we find the word “united”, also only directed to women. I think that the issue of gender interests all of us, so I was surprised to see that the discourse was only centered around women. How should ‘gender’ be represented in the media? Yo quisiera encontrarme un actor que no necesariamente que pertenezca a las organizaciones, sino un actor nuevo, que sea un discurso desde el otro lado, un discurso desde lo varonil, desde el hombre. I would like to find actors that are not necessarily part of an organization, new actors. I would like to see a discourse from the other side, from the masculine [perspective], from men. What words should a word cloud for ‘gender’ have? Creo que el género es un tema que nos engloba a todos, no solo a las mujeres, y seguimos con el mismo discurso de que el género involucra solamente a la mujer. Siguiendo con lo de (la representación) de la ideología, creo que los medios solo lo ponen como algo que alguien dijo, incluso ahí hay una parte en la que se menciona en ideología al (ex-presidente) Correa y (al actual presidente) Moreno, como que si la ideología partiera desde ellos, entonces nos olvidamos de la historia y del origen. I think that gender is a topic that involves all of us, not only women, and we continue to have the same discourse that gender is only about women. Following with the (representation of) ideology. I think that media only talks about that as something that someone said, there is even a mention to ideology in relation to (the ex-president) Correa and (the current president) Moreno, as if ideology would emerge from them. We forget about history and about the source.